Q: How do I know what my time is worth and how do I charge accordingly? This is question I am often asked by new and aspiring business owners as they work their way through the writing of their business plan. The matter of determining what to charge for your time is a personal one. Start-ups sometimes make one of two mistakes in this area: charging too much or not charging enough. The antidote for undercharging is to run a complete set of financial pro formas to ensure that your rates are sufficient to pay the operating expenses and be profitable. The way to ward off both under- and overcharging is to research your competition, with attention to the rates they charge for similar services. With this in mind, here are a few things to keep in mind when setting your hourly rates (list is adapted from the Online Business Planner’s RoadMap Step 44: Present Prices and Pricing Strategy). How price sensitive are your customers? If price is a major purchasing consideration for your customers, you’ll have to toe the line. If price is less important than other factors (quality, speed of delivery, brand, etc. ), you might have more latitude as to how much you charge per hour. Do your customers decide to buy based on price or on other characteristics such as quality, location, or convenience? What is the cost of producing your products or services? Your prices must include the cost of providing the service (cost of goods sold), plus operating expenses, plus profit. What are your competitors’ prices for similar products or services? Those buying your services are continually comparing with competitors; you don’t have to undercut everyone, but you do have to be in the ballpark! How many units do you have to sell in order to break-even or earn a profit? Break-even will be revealed when you complete the pro forma financials. You will want to ensure that you break-even early enough in the year to allow time to earn profit. What are the Industry standard mark-ups or margins for your product or service? Standards or norms should be evident from your research of competitors. In some cases mark-ups or margins might be controlled or influenced by suppliers. What discount rates will you offer for bulk purchases? Be sure your regular prices are set high enough to allow for any planned discounts, deals, or costs such as affiliate marketing. How much will your customer pay for your product or service? At the end of the day, your customers will vote with their money. In the start-up stage, you can survey to determine how much they say they will pay, but once in business you will know whether or not you are making sales, and adjust accordingly. For example, you can test different rates to see if price makes a difference in your conversion rates. What is the relationship of supply to demand? For example, if you use subcontractors to provide services, their rates might determine how much your prices must be. If your subcontractor’s rates don’t leave you enough margin, you might be faced with finding new subcontractors or increasing your rates. What are the consumer buying trends? For example, an overabundance of providers might means lower prices; a shortage of providers might mean more pricing headroom, at least for a while. In almost any market, more competitors will mean you have to have a sharper pencil when it comes to pricing. What is your desired profit margin? Depending on how badly you need to work and how necessary your services are – a well qualified and credentialed consultant who doesn’t need a lot of work might command higher prices as long as they get the amount of work they want. What are your personal and corporate financial goals? Other factors come into play on pricing, such as how much money you personally wish to earn, and what financial aspirations you have set for your business. Welcome to the tightrope we all walk as entrepreneurs and business owners. Hope this helps you find your niche. To get started on your pricing, download the free worksheet we’ve created for you #33 Pricing. Use the worksheet to establish prices for your products and services. You will likely employ all three methods: pricing to market, pricing to cost and break-even pricing. 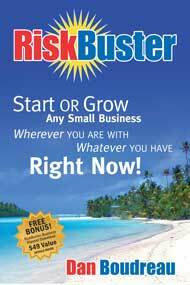 View a complete list of all 66 RiskBuster Business Planning Worksheets here.